Nate Schmidt’s return to the Golden Knights’ lineup is exactly a week away. Suffice to say, he has been missed more than anyone ever realized. I’m not going to get into the 20-game suspension the NHL meted out to the defenseman after testing positive for a banned substance prior to the season. We’re never going to learn the real circumstances as to what happened or what the substance was. But if NHL Players Association executive director Don Fehr is smart, he’ll demand that transparency be built into the next Collective Bargaining Agreement. It will benefit the players to not have to hide behind a bunch of legalities when and if someone gets popped. It would have been nice if Schmidt could have come clean and told the world exactly what happened. But what’s done is done. And as we look ahead to next Sunday and beyond, Schmidt’s return is not only welcome, it is critical to the team’s breaking out of its early-season morass and get itself into contention in the Pacific Division. You all know the numbers. Schmidt leads the team in time on ice. He will help give Vegas’ anemic power play a boost. He’ll help make the penalty killing unit stronger as part of the second unit (Deryk Engelland and Brayden McNabb are the top D pair on the PK). Then there are the intangibles that come with having Nate on the ice. He usually is skating against the opposition’s top forward and does a very good job of limiting the opponent’s chances. He will help the Knights’ transition from defense to offense because he is such a good passer and he sees the ice so well. He also will join the rush and support the attack. I’m sure his teammates will be glad to have him back. He was warmly received in Ottawa the other day as he practiced with the team. He probably regaled the boys with stories of his time in Austria and how he helped the Vienna Capitals maintain their grip on the top spot in the Austrian League by his presence on the ice at the Caps’ practices. That’s all well and good. But now is the time to step in, produce and lift up the Golden Knights. They sure could have used him Saturday at the Bell Centre. To cough up leads of 2-0 and 4-3 and lose to Tomas Tatar and the Montreal Canadiens 5-4 and come away with zero points should have left the players angry. And while you can say the Knights didn’t have Schmidt, Engelland, Paul Stastny and Erik Haula Saturday in Montreal, the fact is they had control of this game and there are no excuses. But let’s get back to Schmidt. Gerard Gallant said he was treating Schmidt’s suspension as an injury. And normally, when someone is out that long, you want to give them a bit of a grace period to find their sea legs, get a rhythm and be comfortable with their teammates. The Knights can’t afford to give Schmidt a break-in period. He needs to be an impact player starting Sunday at Rogers Place. And if he is in as good a shape as he claims to be, that shouldn’t be a problem. Gallant will likely re-unite Schmidt with McNabb, keep Engelland and Shea Theodore together and play Colin Miller with either Nick Holden, Brad Hunt or Jon Merrill. Schmidt and McNabb played together all last season. They know each other’s games. McNabb has been playing well of late and I’m sure he’ll have no trouble adjusting to his “new” partner on the blue line. I’m also sure there will be a bunch of nerves on Nate’s part. Getting to deal with Connor McDavid out of the gate is no one’s idea of fun. But if nothing else, it should have him additionally motivated. McDavid is capable of embarrassing every D-man in the NHL, so Schmidt figures to be focused. Those butterflies will disappear very quickly once he sees No. 97 on the ice. 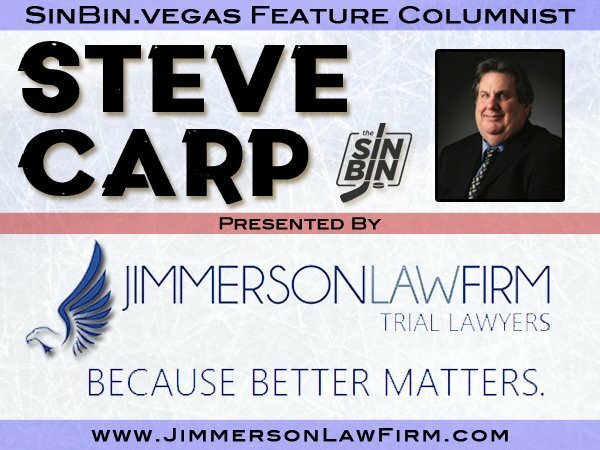 Schmidt’s return helps get the Golden Knights one step closer to normalcy. Of course, it remains to be seen what Haula’s status is. I still thought it was strange that Haula remained with the team in Canada rather than return to Las Vegas to be examined by the team’s doctors. Cody Eakin did a good job filling in as the second line’s center at Ottawa, and given the way the fourth line played, I’m glad I was wrong about moving Pierre-Edouard Bellemare up to Eakin’s spot on the third line. It just goes to show that Gallant knows his team better than any of us. I know many of you are trying to read the Haula tea leaves through your tweets. Perhaps there is cause for optimism that his injury isn’t as serious as first imagined, that he will be able to rejoin the team in the near future. Then there was the theory being bandied about that his injury is so serious, there’s no need to rush getting him back home. That the pending evaluation will reveal he’s done for the season and a few days won’t make any difference. Let’s hope Haula isn’t out long-term. Getting him back after Max Pacioretty rejoined the team earlier in the week and Schmidt’s imminent return to the lineup next Saturday, the Knights can begin to resemble the team we all thought they would be back in July, Stastny’s current injury notwithstanding. And frankly, who knows when we’ll see him again?